Shayna Close had a feeling that two of her dogs, Gem and Gypsy, might be related but she wasn’t able to confirm that until she discovered Embark. 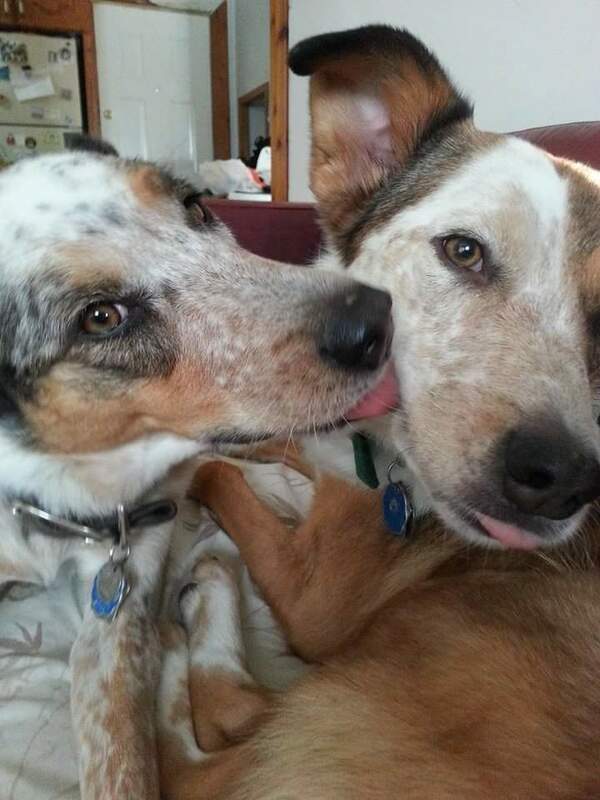 Shayna tested both of her pups using our DNA test kit and we found that these dogs are, in fact, sisters! Shayna adopted Gem in December of 2011 at the Regina Humane Society in Saskatchewan, Canada. According to Shayna, Gem is “super smart” and enjoys competing in dog sports. “She loves obedience and learning new tricks,” Shayna explained. Gem is 7 years old, has a Canine Good Neighbor certificate, and competes in rally along with obedience. She also holds seven titles, including the CARO Versatility Excellence Title! This pup is high energy, smart, loud, and extremely agile. “She even runs up trees and jumps 5-foot fences,” her fur mom explained. Shayna says Gem has a pretty big appetite! “She will work literally for absolutely anything,” Shayna said with a chuckle. When Shayna first saw Gypsy at the humane society a year after adopting Gem, she immediately thought there was a connection between the two pups. “Could they be related?” she wondered. At the end of February in 2012, Shayna gave Gypsy a forever home. Gypsy had been at the humane society for several months, both her and Gem were surrendered separately. Gypsy had a lot of issues when Shayna first adopted her. She was in a kennel during growth stages when it’s typically crucial for puppies to have interactions with other dogs and humans. Because she wasn’t socialized properly, Gypsy was very aggressive. In fact, she had to wear a muzzle when going on walks or to the vet. However, Shayna had been training dogs since she was 12, so she worked patiently with Gypsy until she was comfortable around humans and other dogs. “I still don’t trust her in every situation but for the most part she’s great now,” Shayna said. Gypsy has a funny personality and will climb onto counters to steal food like a cat or jump on top of the freezer for a snack. “If she thinks there might be food up there, she’ll immediately be on it,” Shayna told me. Gypsy will also snag any food left on the table, even if someone walks away for a second; but only if it isn’t Shayna’s food, Gypsy won’t touch that. She’s a lot calmer than Gem, and willing to chill out and sleep. Gypsy is also forcefully affectionate and will rub her chin against your face and give hugs, according to Shayna. She’s not really into obedience like Gem, but she is fantastic at scent detection. During her first class, Gypsy went directly to the working group and found scents that other experienced dogs could not. She even entered her first competition last year! Even though Gem and Gypsy had slightly different birthdays, and the Regina Humane Society said there was no connection, Shayna still thought the dogs were related somehow. She decided to test both Gypsy and Gem with Embark to find out. She learned that her suspicions were correct and they are, in fact, siblings! Shayna mentioned that when the dogs were first reunited, at the Regina Humane Society, they seemed to recognize each other right away! “They are very attached to each other and play in the exact same way,” she told me. Gem is very motherly towards Gypsy and she loves all other dogs, Shayna explained… but Gypsy, not so much. She just loves Gem. Still, both Gem and Gypsy are living happily with Shayna and her other four dogs! Click here for Gypsy and here for Gem. And if you want to test your own pup with Embark, simply click here.